On Thursday night I was invited, along with luminaries from the social media space, to a preview screening of E4's new six-part super hero comedy drama, Misfits, in the hallowed halls of Channel Four. Party-girl Alisha (Antonia Thomas) can send people into a sexual frenzy with just one touch, hard as nails Kelly (Lauren Socha) can suddenly hear people’s thoughts, while one-time sporting hero Curtis (Nathan Stewart Jarrett) discovers he has the ability to turn back time. Even painfully shy nerd Simon (Iwan Rheon) can make himself invisible – which is what he has always felt. Howard Overman's (Merlin, Hustle, New Tricks) treatment of super hero mythology is worthy of comparison to Bryan Singer's The X-Men. Sans sentiment, one scene brutally lampoons The X-Men's Professor Xavier. However, Overman denies such subtext, preferring the audience to embellish! There will be no trite explanation of the meaning behind the mysterious storm that enthuses the ASBO miscreants with super powers, thereby preserving some semblance of enigma and precluding a narrative 'black hole' should Misfits, deservedly in my opinion, garner a second season! And, the creative team should be lauded for holding back on the special effects, which were secondary and tertiary to the charismatic characters. Again, the adage of less is more, applies here, in abundance (budgetary limitations aside)! I should point out that Misfits will embrace, in the words of Channel Four's Steve Berry, 'transmedia storytelling'. This is storytelling across multiple forms of media with each element making distinctive contributions to a viewer's understanding of the story world. By using different media formats, it attempts to create "entrypoints" through which consumers can become immersed in a story world. And, perhaps most coolly of all, audiences will be able to officially follow the protagonists on Twitter; Mad Men fans started tweeting as characters, and the studio, bogged down by old media politics, initially tried to stop it, which was counter-intuitive. 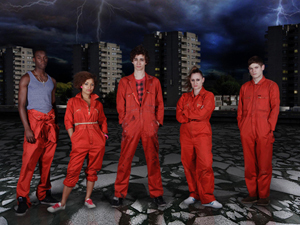 So, set your PVR to record Misfits, which begins 10PM Thursday November 12th on E4. Special thanks to Channel Four's Steve and Alex for being so welcoming.